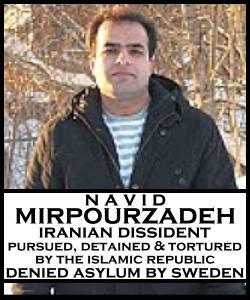 My name is Navid Mirpourzadeh, Swedish Migration ID number 112408447. I was born in Iran. I was a student activist, involved in anti-government activities by publishing and disseminating literature. I was threatened by the security forces on many occasions, and finally was expelled from the university. I was then arrested by the Islamic Republic’s security forces and was detained for a duration of 21 days, during which I was subjected to torture, ill-treatment and humiliation. I was later released on heavy bail. I continued my political activities after my release. In 2008, while traveling to Shiraz to get publication material, I was informed through a mutual friend that my contact, a friend by the name Pouya, had been arrested by the security forces and his place had been ransacked. I was aware of the risks should he be tortured to talk about his contacts; therefore, to avoid arrest, I traveled to Tehran and took refuge at my uncle’s home. During this time I was informed by my cousin that the security forces had visited my family on several occasions and were trying to locate my whereabouts. At this point, I decided to leave Iran to avoid being arrested and prosecuted. I left Iran to Turkey over land, and after 7 months in Turkey, I managed to enter Sweden. Since I arrived in Sweden, I have continued my political activities against the Islamic regime. It has now been 2 years since I applied for asylum in Sweden, but I have been denied asylum. I regret that the Swedish migration office has rejected my application despite no logical, well-established argument for this rejection. My activities against the Islamic regime in Sweden are well documented. These activities include organizing demonstrations in relation to political campaigns against the Islamic regime by the political organizations I collaborate with. 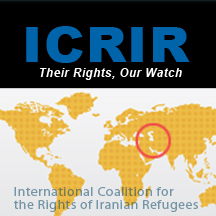 I run my internet-based blog, through which I expose the Islamic regime’s crimes against Iranian people and the terrorist nature of this regime. My site has been hacked by the Islamic regime. I have attached documents regarding my activities. I am a Mohareb, “a combatant against god” as well as a Mortad “apostate,” according to Islamic Republic’s penal code, and the punishment for both “crimes” is execution.